The clasped hands on the bezel of this ring show that it is a fede ring. This type of ring was known in Roman times and has been used in Europe from the medieval period until the nineteenth century. The expression fede or mani in fede is taken from the Italian, meaning 'hands clasped in trust' and was often used on love gifts and marriage rings. The hoop of this ring can be divided into two interlocked circles. Rings made in this way are called gimmel rings, from the Latin word for twin. These rings were especially popular as love gifts, the join of the hoops symbolising the bond between lovers. Around the inside of the hoop is the inscription in German 'CLEMEN KESSELER DEN 25 AUG AD 1607' (Clement Kesseler, 25th of August 1607). This suggests that the ring was made and worn to commemorate a special occasion such as a wedding. This ring would originally have been brightly coloured with enamel, much of which has now been lost. 'Fede' gimmel ring, gold enamelled in white, black, opaque mid-blue, green and translucent red. The ring is formed of two cast intersecting hoops. When closed, the bezel is shaped as two joined hands emerging from enamelled strapwork. The hands bear traces of white enamel and the shoulders are enamelled in opaque mid-blue and translucent red enamel. The first finger of the right hand is broken, as is the thumb on the left hand. The inner surface of the hoops is inscribed: '.CLEMEN. KESSELER' and '.DEN.25. AVG. AD.1607.' in Roman capitals. The letters retain traces of black enamel and are divided by blue stars. Historical significance: The term 'gimmel' is derived from the Latin 'gemelli' or twins and denotes a ring formed of two or more intersecting hoops. 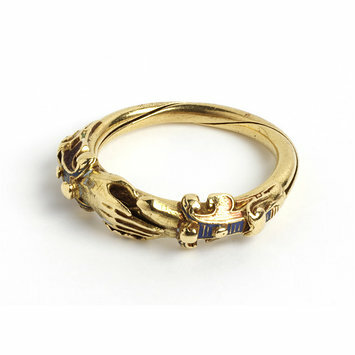 This motif was popular in love and marriage rings in the sixteenth and seventeenth centuries. Inscriptions affirming the indissolubility of the marriage vows would often be inscribed on the hoop along with the names of the couple and their wedding date. The bezel could be decorated with symbols of love and marriage such as joined hands, flaming or winged hearts and forget-me-nots. The clasped hands motif, also present on this ring, is known as fede or mani in fede, from the Italian meaning 'hands clasped in trust'. It is related to the Roman device known as dextrarum iunctio,based on the custom of sealing a marriage with a handshake. It can be found on Roman rings and was used in the medieval period and beyond into the nineteenth century. Both gimmel and fede rings could be used as love gifts. 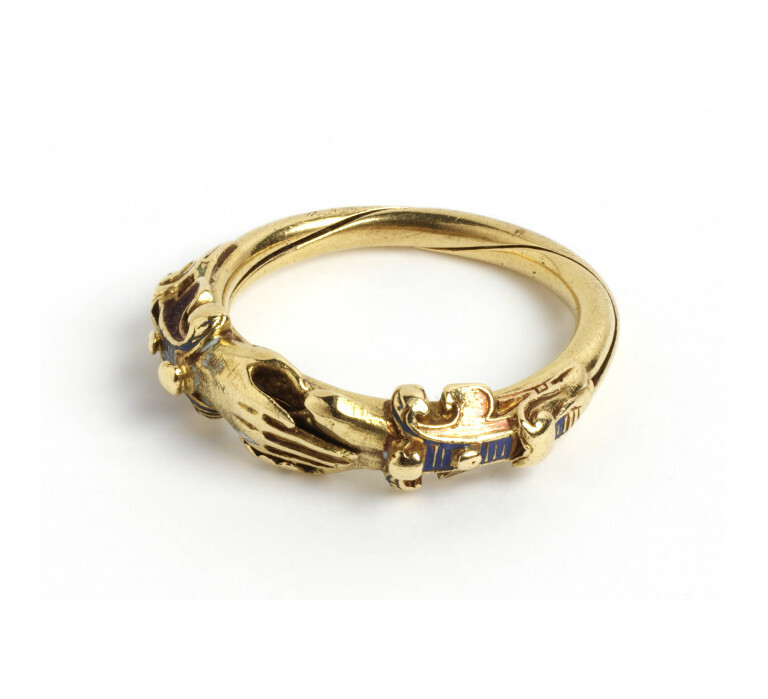 The interlocking hoops of the gimmel ring suggested the ties between lovers whilst the clasped hands of the fede ring echo the marriage ceremony. 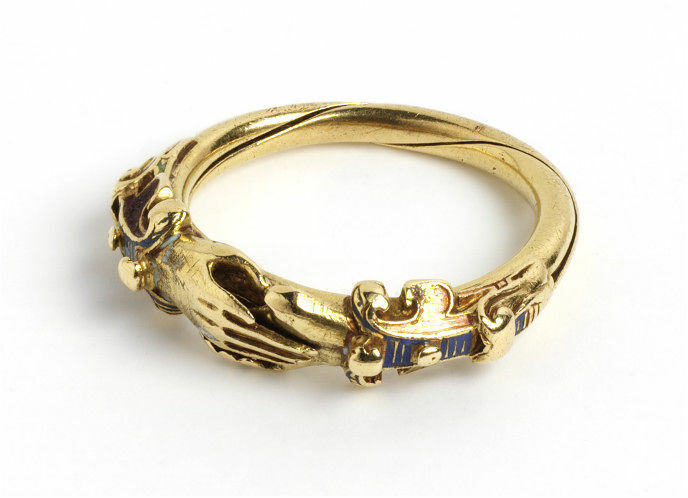 The inscription on this ring clearly indicates that it was made and worn to commemorate a particular event and that it was owned by Clement Kesseler. Oman, C.C. Victoria and Albert Museum Catalogue of Rings, 1930. Ipswich, Anglia Publishing, 1993, cat. no. 664. Princely Magnificence: Court Jewels of the Renaissance 1500-1630, London: Debrett's, 1980.